The My Green Mattress Pure Organic Cotton is a GOTS certified competitor. This pick is as supportive and comfortable as mattresses that are three to four times the price. It’s also one of the best organic cotton mattresses that don’t cause heat build-up and excessive motion transfer. We’ve chosen the one that’s a TWIN size with 3-zone pocketed coil innerspring. The coil innerspring is best for taking care of an injured back, spine, or hip region. It’s also best for blood circulation because of its highly breathable quality. We liked this pick for its all-natural eco-wool and non-toxic cotton construction. As for the expensive pick on the list, the Pure Green Natural Latex Mattress contains all the right components for long-lasting comfort. This pick is best for elasticity and durability. It lasts much longer than other organic mattresses and since it’s latex it’s best for all kinds of sleepers. With medium firmness, it’s best for stomach, back, and side sleepers. Plus, the queen size is best for those who have versatile sleeping preferences. It even helps reduce motion transfer when it’s most required. Organic latex has plenty hypoallergenic properties, while promising a cool and dry environment. A more affordable choice would be the Oliver Smith Organic Cotton. It has a cool memory foam, certified as a non-toxic material with an non-toxic cotton cover. With 15-gauge pocket coils, this mattress is one of the best breathable non-toxic mattresses on the market. It also features a comfortable cushiony feel with a GREEN FOAM certification. It isolates excessive movement since it’s eco-friendly memory foam. And this is a good thing for different sleeping preferences. And unlike some of the affordable mattresses we found, this doesn’t overheat or feel stiff after a few months of use. This is best for people who most often sleep on their back or have a back injury to recover from. Organic, or non-toxic, is a good solution for getting rid of chemicals, flame-retardants, formaldehyde, and fungi forever. Almost everyone is becoming more environmental and health conscious. And wouldn’t you want to get rid of toxins that can harm your body? What commercial mattresses lack, which is original materials such as organic wool, cotton, latex, and bamboo mattresses. What they do contain are a wide range of chemicals, toxins, and Volatile Organic Compounds that cause harm to health and environment. The first thing you need to know is what goes in a mattress and how it supports your entire body. Commercial mattresses are made of many chemicals, including flame retardants, along with synthetic materials. The term “non-organic” is actually referred to all types of mattresses we use today. Innerspring mattresses are made up of a variety of coils such as an open coil, pocket coil, off-set coil, or continuous coil. This is the most common type of mattress to buy on the market today. It is made up of padding, wire coils, and another layer of padding for extra comfort. These mattresses are firm, which is ideal for back and stomach sleepers. These have longer shelf life than innerspring. Plus, they’re softer, more breathable, and cushiony. Memory foam material is best for keeping mold and dust away. This type of foam is used in multiple applications and is know as viscoelastic. Viscoelastic is a highly conformable with or without pressure. Which means it returns back to its original shape after use. Latex mattresses are known for their elasticity, unlike innerspring and memory foam. They’re also extremely firm and supportive. However, they’re not ideal for people with allergies. While most mattresses claim they’re safe for human use, they’re actually not. For a mattress to qualify as organic is must be made of at least 95% of non-toxic materials. And without the use of any harmful chemicals and toxins. And only a few mattresses on the market meet such standards in production and deliverance. There 2 different types of labels you need to look for when determining its quality: some brands claim their products have been developed using resources that minimize environmental impact and the second is when the mattresses causes little to no air emissions for indoor air quality. So, if you’re looking for something that’s the perfect combination of both labels, opt for the best non-toxic mattress on the market. With our extensive research and testing, we will help you find the best organic mattress for a good night’s rest. We looked at the following factors that are the best for determining the right mattress for you. A mattress isn’t firm unless it has been subjected to a number of tests and reviews. The firmness of a mattress is determined by its material and base filling. In the case of organic mattresses, this is between cotton and latex products. The latter is firmer than the former, in both organic and non-organic standards. It is best for people who sleep on their sides. Firmness is essential because it supports your entire body, cushioning your joints while supporting your muscles. Is your organic mattress able to retain warmth? If you’ve read about mattresses, you know what “sleeping warm” means. This not only applies to sleeping comfortably during the winter season, but also in summer. You do not want your mattress to feel stiff and cool when it can remain warm and cozy. An organic mattress’s insulation properties are an important factor to consider. You must know how soon your mattress retains body heat. This also prevents sweating, night sweats, and hot flashes in the middle of the night. Investing in a durable mattress means you want it to last for a long time. Based on various durability tests done by manufacturers and third-party associates, tossing and turning on a mattress must not deteriorate its overall firmness and cushioning. That’s the true mark of durable non-toxic mattress. Many consumers are under the impression that organic mattresses don’t last long. But given the advancement in technique, you can prevent sagging and maintain firmness in fiber for a long time. We looked for mattresses showing no evidence in sagging, weight distribution, and fading. The right pressure of an organic mattress determines how supportive it is. Is the mattress able to retain its shape and feel soft after you wake up in the morning? Does it sink downward as soon as you come in contact with it? These factors determine how pressurized the mattress is. Having said that, a highly pressurized mattress is an uncomfortable mattress. This means it won’t be able to support your joints and posture. The lower the pressure, the more comfortable and supportive the mattress. The My Green Mattress Pure Organic Cotton understands your need for the best non-toxic mattresses. It is the best option for people who want a firm, comfortable, and breathable core. If you do not want your face pressed up against materials laden with harmful chemicals, toxins, and other dyes, go for this one. It has smart mattress edging which reduces motion transfers and offers incredible lumbar support. It takes the strain off your lower back and increases cushioning for blood circulation. The My Green Pure Organic Cotton is one of the best lightest mattresses to buy. It is best suited for stomach sleepers. Plus, it comes with a solid 10-year warranty. During delivery, the core is compressed and rolled for easy portability. And to increase durability, the fibers are washed using biodegradable and bio-based detergent. The floor foundation and base of this pick contains no polyester or volatile compound, In fact, it contains no element that hasn’t been GOTS certified for long-lasting and efficient use. However, it lacks the ideal softness required for body conformability. Hence, it’s no good for stomach sleepers. You can top the core off with a comfortable cotton cover. As a result, this choice is best for side and back sleepers. The Pure Green Natural Latex Mattress is a well-made and medium-firm choice for most people. It offers support for the main body’s pressure points and for contouring. This pick offers a comfortable rather than an overheated or humid sleeping environment. The fiber feels comfortable and is good for breathability. The edges of this core are much better than the competition which supports all kinds of sleeping positions. The best part of this pick is the that it promotes cooling and comfortability. Based on my studies, is good for back sleepers who want medium firmness without being too hard. If you are transferring from conventional memory foam to latex materials, this choice will feel comfortable and supportive. It may not conform to your body as efficiently as memory foam, but after a few nights of used, it is free of chemicals and toxins. The base is 6-inch while the topper is 2-inch of comfortable latex. It gives the perfect height, weight, and support for sleeping for longer hours. Plus, many get to sit and relax during the day without worrying about neck or back discomfort. All in all, the Pure Green is a good brand for your investment. It offers the right kind of firmness and cushioning made with only high-quality and chemical-free materials. The Oliver Smith Organic Cotton is available at a reasonable price. It is cool and breathable with no found traces of chemicals, toxins, polyurethane, or air emissions. This non-toxic mattress does above and beyond to keep you safe. If you have any concerns regarding your allergies or other sensitives, switching to a more breathable choice is essential. Compared to other mattresses, this best pick offers good cushioning and durability features. For starters, it is made up of a ventilated cooling memory foam which is Greenguard certified and has 15-gauge coils. If you want to spend less, the Oliver Smith is a good choice. We don’t think its low price determines it quality. In fact, it has the kind of comfort and cushioning of mattresses twice its price. Available in a FULL size, it is the best kind of bedding for back sleepers. So, it’s a combination of both soft and hard firmness; all made up of non-toxic and certified materials. The Colgate Eco Classica III faired well in our breathability tests. It contains an eco-friendly foam filling made of plant-based materials. Similarly, it is lead free and certified frustration-free to increase comfort and support-ability. Most plant-based materials used in mattresses offer no dangerous air emissions or flammability. They’re lightweight, durable, and efficient at what they’re designed for. And that’s exactly what this best organic mattress has to offer to you. It boasts of a multi-layer design which is firmer and more supportive. The foam is eco-friendly and infused with plant oils to prevent allergies and the accumulation of bacteria, microbes, and common allergens. It’s a 6-inch thick, dual firm crib mattress that’ll last you a long time. When buying a non-toxic mattress for your baby, you need lightness and safety. The Greenguard Gold certification ensures that no harmful chemicals are used in the mattress’s manufacturing. And it also ensures zero air emissions and allergens. The breathable fabric doesn’t cause skin irritation, sweating, or heat build-up. It is designed to keep your baby comfy, cushiony, and well-rested. On an ending note, this pick provides a soft, clean surface for your child to sleep on. And is the best choice for toddler years. The Naturepedic No Compromise Classic Crib is 100% free of harmful chemicals such as polyurethane and volatile organic compounds. It contains hypoallergenic and dust-mite resistant properties. Plus, the 100% polyethylene surface is waterproof and easy-to-clean. After considering a range of baby mattresses, more specifically of crib-size, we found that this is the best non-toxic mattress for its durable properties. Parents know how accidental spilling is an everyday thing when it comes to taking care of newborn babies. So, wouldn’t it be great to use a waterproof crib mattress? This one we considered is certified organic and has an outer waterproof lining brushed with food-grade polyethylene. However, it does not contain any flame retardants, harsh chemicals, and no traces of air emissions. 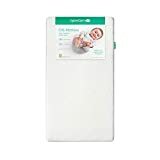 It meets all “organic” standards and is sufficiently lighter than most other crib mattresses. With such uncompromising quality, efficiency, and durability, it’s hard to look over this one. It works for more than a year and has no pungent chemical smell at all. The coils feel breathable and comfortable and lacks the excessive bouncy feeling of most mattresses. You would feel safer knowing that your child isn’t exposed to harsh chemicals or allergens right from where she sleeps. What’s better than a mattress that resists water? It’s a mattress that can be washed more often than not. That’s the Newton Wovenaire Beyond Organic. It is made of eco-friendly breathable and washable materials, including food-grade polymer. With no traces of flame retardants, volatile organic compounds, or other fillers, this is one of the best non-toxic mattresses for babies. With innovative air-pressure technology, this crib is made from 90% air volume. This feature offers incredible head, neck, and shoulder support for your kid. And it also offers the ideal cushioning firmness. You can unzip the entire outer cover of the mattress and throw it in your front-loading washing machine. That fact that the core is made up of 90% air and 10% grade-polymer, it doesn’t attract bacteria, moisture, or mold. The Newton is Greenguard certified for long-term and efficient use. So, you and your kind can rest comfortably on this mattress for as long as it takes. Made sure the cover and core are washed with cool water. You can even use a washer-dryer combo to tumble dry them on low-heat setting. It doesn’t give away its thickness, firmness, or cushioning after a few washes. The Naturepedic Organic Quilted Deluxe is a simple quilted non-toxic cotton mattress. It weighs less than 55 pounds, which is both lightweight and efficient. And the kind of support this bed has to offer is much different than other one-sided mattresses. Since it’s certified non-toxic, it has medium firmness which is perfect for motion transition. The exterior fabric has the ideal kind of thickness and softness. You won’t sense a funny smell even when you use the mattress for the first time. It provides a comfortable, supportive, and easy-to-clean surface. Many one-sided quilted mattresses contain vinyl, VOCs, or phthalates. But this one is certified for lifetime support. It’s made of organic cotton which is firmer and more comfortable for side sleepers. And it’s made without the use of harmful and toxic flame retardants. So, the Naturepedic is a comfortable mattress at an affordable price. With certified non-toxic cotton filling, the Naturepedic 2-in-1 Ultra is a classy choice. It is available in a TWIN size with 360 coil system to boost breathability. Its best of the best feature is the waterproof surface which you can wipe clean in case of an accidental spill. The base is made up of non-toxic cotton which is free of harsh chemicals, allergens, and other elements. This mattress is also hypoallergenic for long-term use. 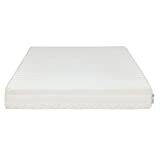 For durability, it has a 2-stage filling to increase both softness and thickness that’ll last you longer than most non-toxic mattresses at the same price. The medium-firmness and padded edge support are good for back and side sleepers. In fact, it even cushions stiff joints and muscles since it’s certified for orthopaedic support. The innerspring is good for reducing movement or motion transfers. While the certified hypoallergenic feature is good for reducing night sweats and sneezing. This pick is an equally durable and efficient pick. It has the kind of base and topper that offers support and is incredibly effective. And it doesn’t overheat as most other toxic mattresses on the market. If our best of the best pick sells out, don’t think twice before buying the Naturepedic 2-in-1 Ultra. The Latex For Less Natural Latex is a organic 2-sided QUEEN mattress. It comes at a reasonable price with straightforward ingredients that make up its filling. It has a latex filling and cotton cover; both non-toxic and free of harmful air emissions. The engineers responsible for this wonder used simple and efficient materials for better support and comfort. This is an unadulterated latex material which is supportive enough for all sleeping preferences: back, stomach, or side. It’s even a reversible type which conforms to your body and weight without sinking in. The Latex for Less is sufficiently firm and offers a good balance between cotton and latex. To top it offer, the natural wool fire barrier increases firmness. While the hypoallergenic quality increases breathability. So, no matter how thick this mattress feels, it won’t cause night sweats, allergies, dust, or overheating. For dual firmness flexibility, flip the mattresses of either side to suit your sleeping needs. Most conventional mattresses lack such intuitive features, to begin with. This pick is widely available online; plus, it comes with a solid 20-year warranty at a reasonable price. Backed by its incredible customer support, nothing beats down the features and construction of the Latex for Less. The Folding Pack-n-Play Mattress is a portable and comfortable mattress. It’s best for saving up on both space and money. Especially if you move around a lot. You no longer have to compromise on quality when you want a folding bed to go wherever you go. This one has a non-toxic latex core and a soft cotton cover. It’s best for travel, children use, and for saving space in your studio apartment. It meets all flammability standards and is hypoallergenic for long-term use. It’s lightweight, firmer, and durable. The 2-inch thick latex core is ideal for side and back sleepers. Plus, it reduces motion transfer and isolates excessive movement. Another impressive quality of this folding bed is that it’s washable too. Due to its optimal thickness and light weight, it can be washed once in a while to do away with dust, stain, or smell. On a similar note, this folding bed is also best for kids with a flat head. If your kid is headed out for a sleepover, this bed can be his companion to keep him comfy for the rest of the night. The latex foam is easy to store and does not attract bacteria or microbes or moisture when kept in storage. Comparing and testing a number of non-toxic mattresses on the market, whether for adults or children, wasn’t as easy to we thought it would be. We gathered our final best 10 picks as they gave impressive hands-on quality and warranty. We took into consideration how breathable each mattress is, how durable, and lastly how non-toxic and efficient. We also found that a single mattress doesn’t work for everybody. But they’re ideal for stomach, back, and side sleepers. The best organic mattress can do what conventional mattresses cannot. And that is protect your body, others around you, and the environment. We looked at the following non-toxic mattress labels that are the best at what they do. Based on our meticulous research: the Global Organic Textile Standard and the Global Organic Latex Standard are the most in-depth and reliable qualifications for meeting environmentally- and human-friendly requirements. The main purpose of this standard is to meet certain requirements that promises the harvesting and production of raw materials in an environmentally-friendly and socially responsible manner. This means the final product that reaches the end consumer is organic. The labelling of each product based on this standard means all textile processors and manufacturers accept and adopt the world-wide recognized standards of non-toxic textiles. In most standards, 95% of non-toxic status is permitted with only 5% residue for chemicals such as flame retardants, polyurethane, and other ingredients that make up synthetic materials. The primary aim of GOLS is to be responsible for 95% of organic latex and 5% of other synthetic chemicals and other components. Organic latex materials can have both Global Organic Textile Standard and Global Organic Latex Standard. The processing of such certified products can be in plain latex or finished latex foam form. This is done in combination with thorough inspections to maintain the set of requirements need to keep the environment happy. Moving forward, these following standards ensure organic and safe labelling of mattresses. They ensure the absence of volatile compounds, flame retardants, and other toxic chemicals are kept in check during the processing of an organic mattress. Organic Content Standard 100: This standard is associated with the final percentage of organic materials, that are certified and labelled. It also is associated with the total percentage of the use of non-organic materials such as polymer, VOCs, additives, fillers, and other colorants. That said, the total cost of such certified mattresses is a bit more expensive than most. This is because these are a part of high-quality and long-lasting organic mattresses. So, when you learn more about this standard, you know the mattress you’re buying is a keeper! Greenguard: Greenguard has a further classification known as Greenguard Gold. The former, which is a simpler standard, focuses on air emission tests and the absence of VOCs in a mattress. Certain chemicals find their out of a non-organic mattress, such as formaldehyde, which harm the environment and humans. Hence, Greenguard ensures there’s no such back talk from organic mattresses. The latter, which is Greenguard Gold, dedicatedly focuses on Volatile Organic Compounds and its emission limits. When a mattress is made “non-toxic cotton or organic latex” a portion of its materials may seem unsafe. In such a case, almost all manufacturers use non-organic compounds to process non-toxic materials. This needs to be prevented in certified products and Greenguard Gold is responsible for it. CertiPUR-US: The main purpose of this standard is to deal with mattresses that are made up of synthetic materials such as polyurethane foam. If your non-organic mattress has this label, it means it doesn’t contain as many VOCs, colorants, PDBE, and flame retardants. CertiPUR-US inhibits the use of extremely harmful substances for the processing, manufacturing, and packaging of mattresses. Q. Why is organic a better option? It must be chemical-free cotton, wool, or latex material. The material must be resistant to mold, dust, and allergens. It should have better temperature insulation properties and the ability to repel moisture. Non-toxic materials contain no pesticides, are free of VOC materials, and are mostly hypoallergenic. Having said that, you should know that cotton, wool, and latex aren’t common mattress materials. This means that they aren’t built to last longer than commercial bedding. And even if they do, they are bound to lose their comfort and support-ability after a few months. Wool when harvested and processed in a variety of forms is often treated with chemicals to prolong its shelf life. This is also done when manufacturing wool products to resist heat, water, and flame. Wool is a naturally waterproof material, but harmful compounds are used in its processing to make it 100% waterproof and dependable. However, unprocessed wool can attract moisture, sweat, and water; which can penetrate into the mattress fibers and cause microbial and bacterial growth. This contributes to the loss of comfort and durability of mattresses over time. Latex, on the same hand, does go through several chemical procedures to increase shelf life. Also, latex is known to cause allergies and sensitivities. So, with the help of such additional chemicals, the inflammatory effects of natural latex are controlled. This concludes that the use of toxic chemicals and VOCs in mattresses can do more harm than good. That’s why you need the best organic mattress to keep you company. It’s also true that organic processing of raw materials leaves little to no carbon footprint in the environment. So, you can have a good night’s sleep knowing that the mattress you’re sleeping on isn’t causing harm to the environment as much as you. When organic fibers and fabrics are grown and manufactured without toxic pesticides, colorants, flame retardants, etc. they’re naturally hypoallergenic and breathable. This is a major advantage for anyone looking for a simpler, yet efficient alternative to commercial products. Q. Why is it difficult to buy organic bedding? A. The disadvantages of buying organic mattresses is more of a convenience problem than quality. Finding the best organic mattresses is not easy as buying commercial bedding products. Only a few reliable brands deliver on their promises of an environmentally friendly and socially responsible mattress. This too has its drawbacks. For example, it’s easier to look for products online unless you live in a secluded or non-metropolitan area. Physical retail stores don’t often sell organic mattresses and those that do refuse to offer exchange policies or return policies, which is not the case when you shop online. Compared to commercial bedding, made of memory foam or spring, you will not find as many options for non-toxic mattresses. This means you won’t have a wide range of colors, styles, and patterns to choose from. In the case of non-organic bedding, you might find a combination of 2 to 3 materials such as spring mattresses with wool or nylon stuffing or latex with memory foam, etc. But this is not possible with non-toxic mattresses. Moving forward, if you’re unfamiliar with certain terms and labels for buying non-toxic products, shopping can get a bit confusing. You wouldn’t know what to look for and how to bargain. There are many things to compare when shopping online such as certification, firmness, air emissions, durability, and so on. It can also be that the brand you’re buying from offers a combination of both organic and non-organic materials. While other brands may use false claims to increase their sales. The best way to stay ahead of such drawbacks is to research and compare products before buying them. With the help of this guide, you can easily compare prices, materials, certifications, and other factors you find important. And if you’re wondering why you pay more for something that uses limited resources than traditional methods, it’s because the certifications that certify these products are expensive. So, if you’re willing to invest in something durable and healthy, make sure it’s backed by significant certification standards. Q. What are the common harmful substances found in today’s mattresses? Boric acid is a highly toxic substance which is also substituted as a roach killer and an insecticide. This application proves that it’s the worst kind of chemical to be present in a mattress. Many other paints, pesticides, lotions, and other antiseptic products use boric acid as its ingredient. And the reason why many brands use boric acid for bedding is to prevent mold, bacteria formation, bed bugs, and other insects. Flame retardants are used to prevent household fires by foreign objects such as cigarettes and candles. A Californian law in 1975 made it compulsory to include flame retardants as an ingredient for all memory foam mattresses. However, at this point, the use of flame retardants has become more harmful than life-saving. Synthetic latex is processed and chemical-infused latex. It is manufactured using Volatile Organic Compounds. Processed latex is bad for a lot of reasons. It may be a carcinogenic compound for many with side-effects affecting cognitive development, skin problems, and upper respiratory conditions. Other substances include formaldehyde, antimony, colorants, and other dyes which emit a strong smell and are often inflammatory. Inhaling such fumes can result in respiratory damage, skin irritation, and allergies in both children and adults. That said, children are more prone to such effects than adults, so if you have them, it’s time to upgrade to organic mattresses for their health and well-being. The My Green Mattress Pure Organic Cotton comes from a certified and efficient brand. It is a mattress that works for everybody; be it a back, stomach, or side sleeper. It has medium firmness and is sufficient soft and breathable to suit your style. And we also found that it offers the right combination of warmth and cooling for your room, so you can switch sleeping positions comfortably.